This is the tomb of the world’s first empire builder. A steep flight of stairs across a dramatic ravine between sheer mountain faces leads to the remote entrance. It was excavated in the 18th Dynasty when the Pharaoh’s chief aim was concealment. When it became evident that these precautions were useless, the tombs of the 19th Dynasty were grouped together under an armed guard. The design is simple. After the stairway a sloping corridor descends to a staircase which has broad niches on both sides (/). 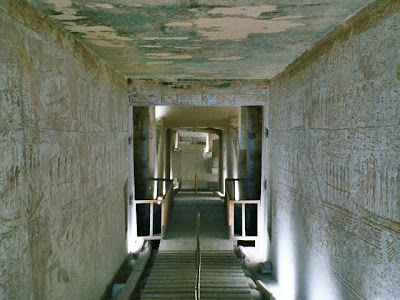 Beyond this is another corridor leading to a rectangular shaft (crossed by a hand-bridge) and into a chamber (2) which has two undecorated pillars and a ceiling covered with stars. The walls bear the names of 741 different deities. The tomb chamber (j) is approached by a stairway and is in the form of an oval. The scenes of the underworld are mostly in excellent condition. The representations on the pillars are delightfully simplified black drawings. On the face of the first is a religious inscription and on the left-hand face (from top to bottom) are Thutmose and his queen-mother Isis in a boat, the king being suckled by Isis in the form of a tree and (below) the king being followed by his three wives and the princess Nofretete. On the third face of the pillar are demons. Demons and religious inscriptions adorn the other pillars. The sarcophagus, on an alabaster pedestal, was made of red sandstone and was found to be empty. The Pharaoh’s mummy was safely in the Deir el Bahri shaft.